After a 13-day cruise in Antarctica (see previous post), I continued north to Chile. How did I spend 9 days in Patagonia’s famous Parque Nacional Torres del Paine? Trekking, of course! My 9-day, ~81-mile (130-km) “Q” Circuit included the “tail”, the “W”, and the “backside”. I did the hike with Steffen (Germany) whom I’d met en route to Puerto Natales (the closest town to the park). After the first campamento (campground), we befriended Florencia (Argentina), Verena (Switzerland), Grant (Australia), and Jonas (Denmark) who we trekked with for most of the remainder of the route. We also befriended Chris (UK) and others along the way doing parts of or the whole circuit. Hiking with these good peeps added to the whole experience, and was especially helpful in keeping spirits up when trudging through copious amounts of mud and coping with almost daily rain and high winds. Having completed the trek, I think the park is amazing. But to be honest, I had moments of doubt, like when trekking for several hours through pastures or scrubby foothills. While very pretty, I felt like the overall topography and vegetation were too similar to places I’ve hiked in the So Cal mountains or even the lower elevation areas of the Sierra mountains. From all that I’d read about this park and given the rain, crazy strong winds, and the amount of mud I encountered everyday, I wanted to be blown away (figuratively speaking). For the first few days, I was worried I’d be disappointed. However……the park did NOT disappoint, in fact, I was blown away (figuratively and literally). Along with pastures, I hiked through native grass and shrub lands and moss-covered beech tree forests; hiked along cloudy gray glacial-fed rivers and turquoise glacial-fed lakes; hiked underneath the many snow-covered peaks variously lite up by the sun and shrouded in dark rain clouds; and viewed the famous Las Torres peaks lite up by the rising sun’s rays and topped with an amazing rainbow. In addition to the Las Torres peaks, the park’s undisputed crown jewel, I hiked along glacier Grey, part of the Southern ice field, the 2nd largest sub-polar ice field in the world. And the day we hiked over the pass and viewed this massive glacier, it was speckled by patches of sun peeking through dark clouds, and also topped with an amazing rainbow. I’m not sure why this glacier and associated ice field don’t receive as much press as the Las Torres peaks, but to me, these were the crown jewels of the park. 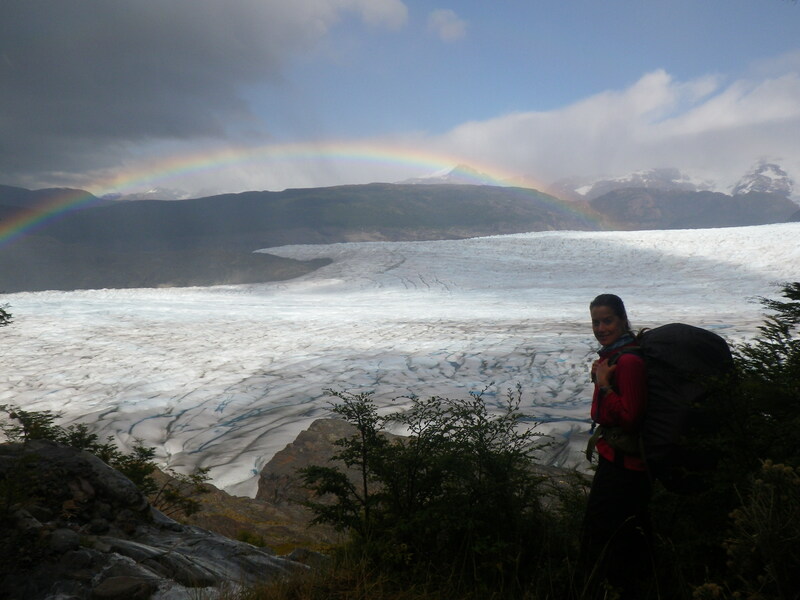 Trekking in Torres del Paine exceeded my expectations both because of the people I shared the experience with and because of the park’s natural splendor. This entry was posted in Chile, Patagonia, South America and tagged Parque Nacional Torres del Paine by Tannika. Bookmark the permalink.